Merchants Hall is the newest and latest addition to Our Holy City of Charleston, SC collection of exquisite wedding venues. Offering a spectacular view of the City Market, that is visited by most tourist and locals. Located on the second floor. This brand new renovated 2,800 square feet wedding venue, offers an abundance laid, exposed bricks, with fresh smelling and beautiful hardwood floors, Roman shades on each window, and to top it off and compliment the overall feel, 12 feet ceilings, with the most spectacular artfully curated chandeliers, that will take your breath away the minute you walk through the doors. It offers an elevator, a beautiful iron stairway, with hardwood floors, the perfect bridal suite, and some of the most beautiful bathrooms, with amazing mirrors. Thus not only for the history but also for most wedding clients satisfying their taste and vision for having a true elegant southern wedding soiree. ..To me with all that Merchants Hall has to offer, it is about taking this wedding venue and capturing the many different elements it has. By giving any and all wedding clients, a great idea of when hiring a wedding photographer here in Charleston, SC, but most importantly for them to see the endless possibilities with my proven 18 years + experience and knowledge about wedding photography & photographic equipment, lighting, and my vision into creating a one of a kind wedding image that is pure art. ..This image came from a style shoot I had with Intrigue events and Jardiniere, and other amazing wedding vendors. 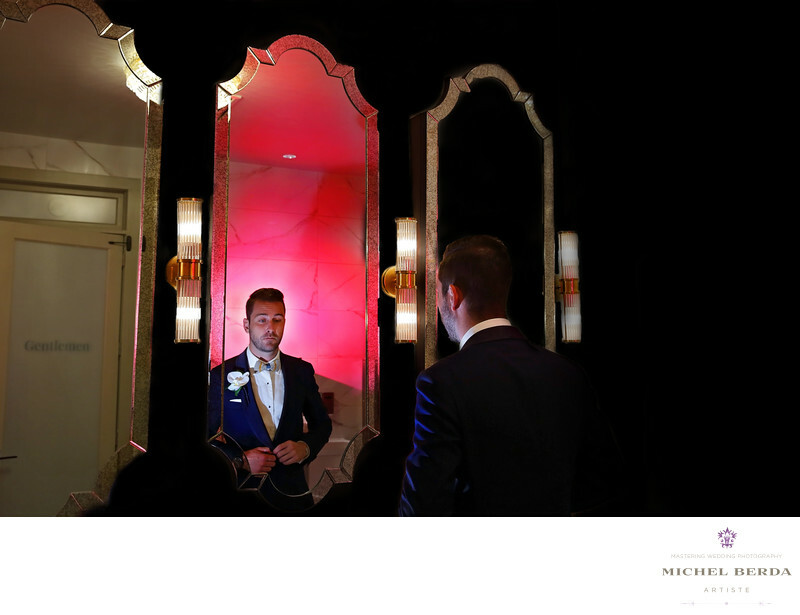 I was given the task with this so charming groom to create an image that would reflect getting ready in the bathroom. Knowing my lighting was a key factor for this image, I began to study the lighting and figure in how I could complement this image to have that WOW factor even more with gels and lighting effects. Thus creating to me a truly memorable and well-documented wedding image of the groom getting ready. Keywords: intrigue (3), Jardiniere (3), king street photo weddings (219), merchants hall (6), ooh events (3), style shoot (3), wedding images merchants hall (3), wedding magazine (3), wedding photographer merchants hall (3), weddings merchants hall (3).